The hardest part of any purchase for a B2B buyer should be selecting what company to buy from. Once that buyer has decided to purchase from your business, everything should be made as simple and easy as possible for the customer, even logistical nightmares, like shipping. Having an easy-to-use user interface (UI) for shipping helps the customer keep track of how many containers of items will be shipped, how their purchase will be shipped, who will be delivering it, and when will it get there. With most B2B purchases, packaging and shipping isn’t as easy as just throwing an item into a box or bag with some packing peanuts. Pallets have to be built, containers have to be filled, and every inch of wasted space could end up costing you or your customer money. 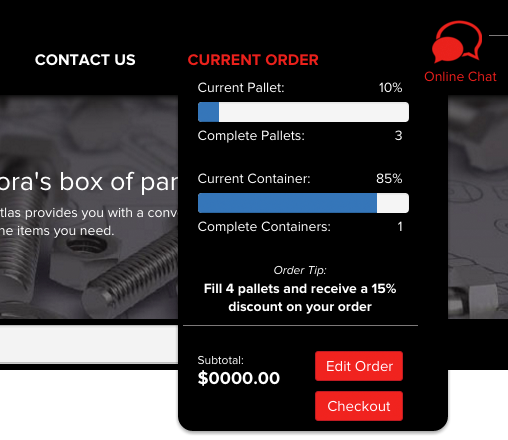 To help customer’s get the most out of shipping costs, your user interface should include information that lets the customer know how full their pallet, container, or box is and how much space is left in it. Providing a progress bar or percentage full number helps your customer keep track of how much space they have left in their container to get the most out of their shipping costs. In the image to the right, you can see exactly how one instance of custom B2B shipping UI is presented in a Clarity eCommerce implementation. The UI is clean and clear and presents the most important information in a way that is easy for the user to understand. If the customer needs help deciding how to best fill out their order, they can simply click the Online Chat for assistance. Another handy feature to include in your user interface is the percentage space products take up in a container or on a pallet. Showing customers how much space a particular product takes up helps them make a more informed choice on whether to add it to their cart and how much of it they should add. If they know that they still have 5% of their container space left and the item they are viewing takes up 2%, then they will be more willing to buy two instead of one because they will feel that they are getting a better deal by using all of the space available. This feature helps customers make the most out of their shipping space and helps your business by encouraging customers to buy more. 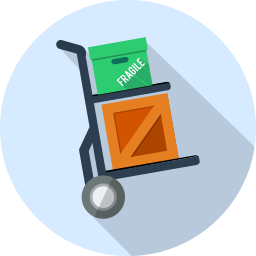 Your shipping user interface also needs to include a list of different shipping options and shipping carriers that your customers can choose from to handle their purchases. Integrating with multiple carriers helps ensure that your customers get the best price available. Listing all of the carriers you’re integrated with, their shipping prices, plus any additional fees, such as notification before delivery, lets your customers choose what price they want to pay or what carrier they prefer to use. Having all of these features and options in your user interface helps buyers easily purchase from your business again and again. In this video, Ron demos for us a custom shipping implementation we did for Brick Packaging. 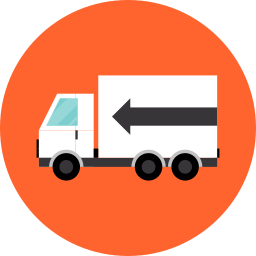 In this instance, the customer implementation includes an eCommerce integration with Microsoft Dynamics GP, as well as custom integration with LTL Carriers. These integrations allow for the UI to configure the order, including freight shipping costs, without any intervention from the client's sales team. Shipping options are displayed from cheapest to most expensive, and the custom shipping options allow the customer to select several options such as what days they are able to receive shipment or what sort of trucks their facilitates can accommodate. These robust capabilities make for an excellent online customer experience that greatly increases your chances of securing repeat business. For nearly a decade, Clarity has been providing customized business solutions for B2B companies. We stay on top of the latest trends in B2B eCommerce and take the time to find out what our clients truly need from us before offering a custom solution. Our team of expert developers has helped many B2B clients perfect their B2B shipping setup and shipping interfaces. To speak with an expert about improving your shipping and your user interface implementation, call or click to contact us today!